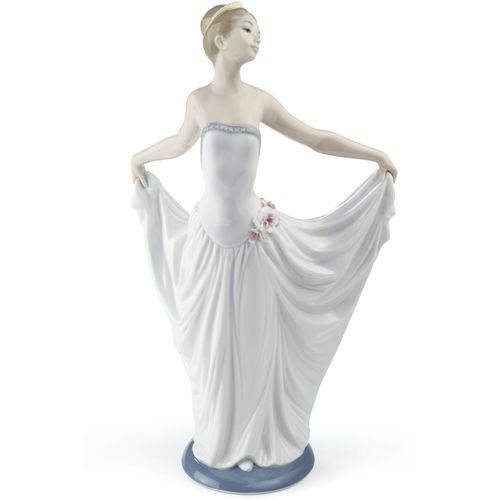 This beautiful porcelain figurine of a elegant dancer, dressed in a flowing pastel white and purple dress and a tiara is ideal as a gift for a loved one who is a dancer or simply appreciates elegant dancing. With her arms outstretched behind her and holding her long dress, she almost floats as the delicate detailing on her dress combines with the delicate peachy hues of her skin, which accentuates her beautiful form. A wonderful classic from Lladro, an intricate hand-made porcelain flower adorns her hip, completing this stunning piece. Lladro Porcelain is produced by Artisans in Valencia in Spain. Lladro is made for memories, these beautiful classic and timeless creations make the perfect gift for all those special occasions throughout the years and make wonderful keepsakes for family & friends to treasure. Each piece is lovingly handmade and hand painted & comes with their unique Lladro markings by the Valencia Artisans. The Lladro Dancer (Special Edition) comes presented in its Lladro presentation box & a certificate of authentication.